Since 1960, which is the starting point for the Mapping Museums research, UK museum professionals have used five different definitions of museums. It was surprisingly difficult to track down this information so in this post I provide a list of past museum definitions and a brief commentary about their relevance to the Mapping Museums research. 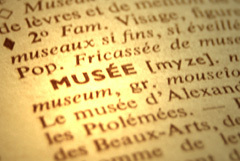 A museum is a non-profit, permanent institution in the service of society and its development, open to the public, which acquires, conserves, researches, communicates and exhibits the tangible and intangible heritage of humanity and its environment for the purposes of education, study and enjoyment (2007). The introduction of definitions helped shaped the remit of museum surveys, and hence past and current conceptions of the museum sector. In the next few posts I’ll be discussing what kinds of venues were routinely included and excluded from official reviews and surveys. Here, however, I want to make a few brief observations about the definitions noted above and how they relate to the Mapping Museums project. All the definitions state that museums are ‘institutions’, which suggests that the organisation has established procedures and practices, and that it is or will be of long-standing. It can also imply that the museum is contained in a building. The ICOM definition refers to a ‘permanent institution’, which further underlines notions of longevity. However, equating museums with permanent institutions is problematic for organisations that do not have a long term lease on their property, that are housed in fragile premises, or are run as pop-ups. Hence the definitions tend to exclude venues that are new, are not financially secure, or have a more experimental form. With the exception of the most recent ICOM formulation, the definitions also place a high degree of emphasis on objects. The 1971 rubric specifies that museums keep objects relating to the arts, sciences, or human history, terms that are replaced by ‘material evidence of man and his environment’. This patriarchal formulation reduces humans to ‘man’ (in the singular) and claims a possessive relation to the natural world (‘his environment), as if the world was primarily a context for man’s existence. This definition, in turn, was superseded by the phrase ‘material evidence and associated information’, which recognises that museums may also collect various kinds of archival and documentary material, not just the objects that go on exhibition. In its most recent iteration, the UK Museums Association refers to ‘collections’, a more general and hence inclusive designation, but one that has prompted us to ask: what constitutes a collection? How many objects are required for a collection? Can a building or an archaeological site comprise a collection? Other points are worth making. The 1971 definition does not require museums to be accessible to everyone, whereas later definitions put a high emphasis on public access and benefit. In 1977 ICOM requires museums to communicate and in 1984 the Museums Association has decided they must also interpret, terms that simultaneously reflect and promote the move from museums being relatively inward facing and functioning as storehouses and centres of research to museums being outward facing and actively engaging audiences. It is also notable that until 1998, the Museums Association definitions make no reference to governance. The issue of whether a museum is run as a business, has no formal structure, is in private hands, is a not-for-profit, or established as a trust, is irrelevant to whether it is considered to be a museum. This particular aspect of the newer definition has real consequences for small independent museums that have been set up on an ad hoc basis, or provide employment for its founders or owners as it means that they officially cease to qualify as museums. Above all, it is important to note that definitions change. I stress this point because, in the course of collecting data for the Mapping Museums research, various professionals have queried and, on occasion strongly objected to us collecting information on museums that fall outside of the current definition. Yet no definition is set in stone. They do not encompass some universal truth or essential quality. Rather, each definition have been introduced and written in particular historical, cultural, political, and economic circumstances. For example, the Museums Association definition of 1998 was devised in response to the policy directives of the New Labour government and to demonstrate that museums could have a role in the wider public sphere. No doubt the definition will change again, and indeed representatives of ICOM will discuss that possibility at the Defining Museums conference in St Andrews in November this year. A related point is that multiple conceptions of museums are in circulation at any one time. For this reason I applaud the 1971 rubric because it begins with the phrase ‘We define…’, the implication being that this is our definition but there are others. That open-handedness is lost in subsequent definitions, which present the characteristics of museums as being matters of fact rather than as one possible conception among many. It is time to revise that position. © Fiona Candlin October 2017.